Place olive oil in skillet and heat to just to smoking. Add tuna steak and sear on each side for 30 seconds (tuna will be rare in the interior). Remove from pan, and allow to cool for 3 minutes, before slicing into 1/4″ slices. Arrange 3 ounces of spinach on each plate, add carrots, red onion, mushrooms, and celery (you may also add any other vegetables you like). Place 4 ounces sliced tuna on each plate, in a star pattern. Sprinkle with sesame seeds. Serve Kosher salt and fresh cracked black pepper on the side, along with Soy Sesame Dressing. Place all ingredients in a medium bowl and whisk to combine. 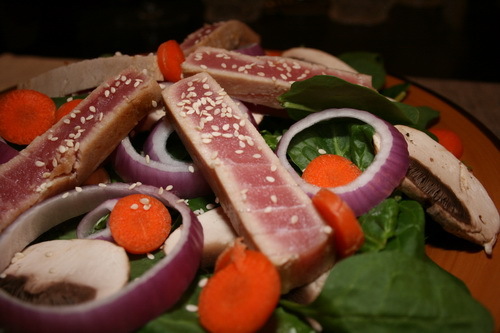 Serve in small dishes alongside the seared tuna salad.